Many of us depend on our Facebook page, to share our everyday lives with friends, and just as importantly to keep up with others. So imagine if Facebook told you its planning to shut down your page. Several Don't Waste Your Money viewers have received that threat, in a frightening message in recent weeks. It claims you've made "copyright violations" on your page, and says if you do not respond in 48 hours "your page will be suspended." But the site Hoax Slayer says it is all a sophisticated phishing scam to steal your login credentials. 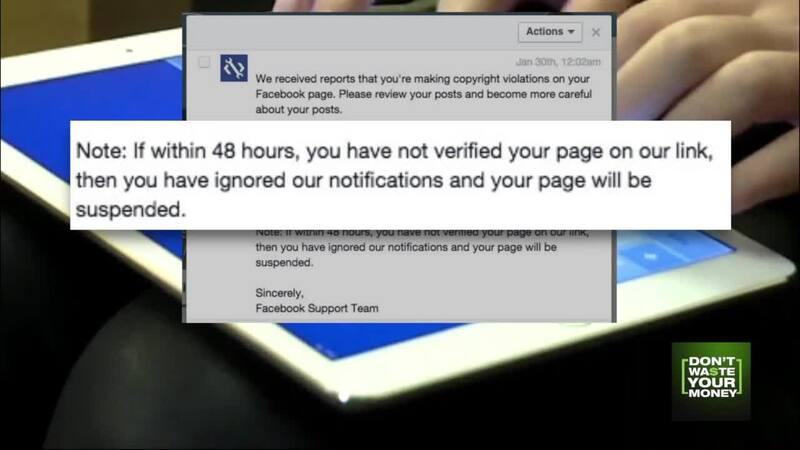 Hoax Slayer says your Facebook page will likely be hijacked, if you provide all that information. That's what happened to two women, Bev and Jennifer, earlier this year, when their Facebook pages started spamming their friends about bogus government grants. "I didn't send those messages," Jennifer told us. If your page is hijacked, you'll say "doesn't that stink?" Never share your Facebook login, even if it seems Mark Zuckerberg is threatening to shut your page down.